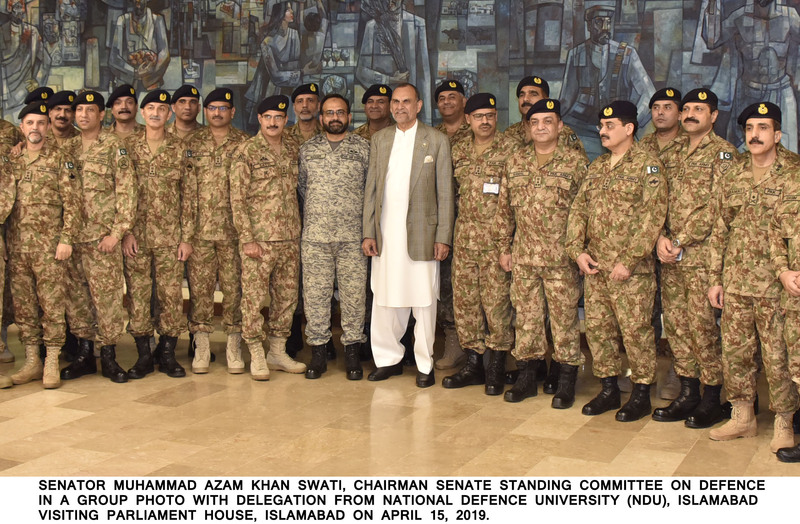 A delegation of 39 two star officers from the Command and Leadership Program (CLP) at the National Defence University (NDU) visited the Senate Secretariat at Parliament House on Monday. This was a curriculum visit to provide officers of the CLP with an opportunity to interact and gain firsthand knowledge of the Institution. The group was headed by Major General Asif Ali, HI (M), Director General Institute for Strategic Studies Research and Analysis (ISSRA). The delegation toured the Senate Hall and was briefed about the electoral and legislative process at the Senate of Pakistan. Later, the delegation visited the Senate Museum after which it attended a reception hosted in its honour by Chairman Standing Committee on Defence, Senator Azam Khan Swati. He appreciated the contribution of the Armed Forces towards the prosperity and security of the nation and said that our men and women in uniform are Pakistan’s pride. A shield to commemorate the visit was presented to the University delegation.